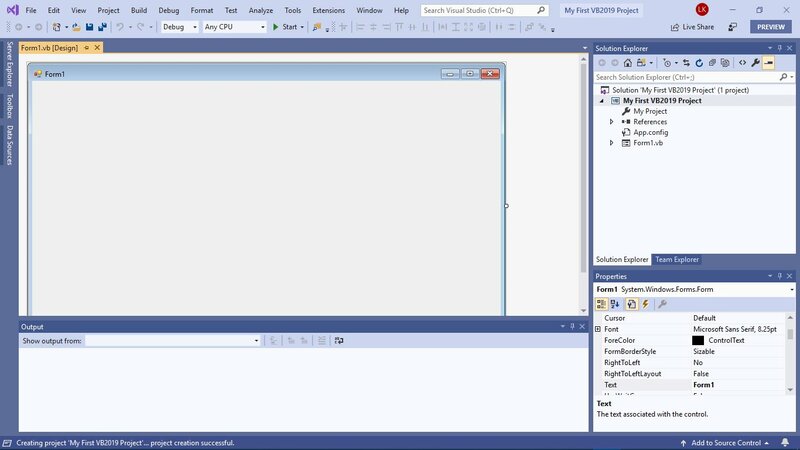 Prior to creating a Visual Basic 2019 project, you need to conceive an idea of what kind of project you intend to develop. Maybe you want to develop a desktop game, a multimedia app, a financial app, a database management app and so forth. Once you have decided on the app you wish to develop, the first step is to design the User Interface(UI). To design the UI, we suggest you sketch it first on a piece of paper before working on it in the VB2019 IDE. After completed and refined your design on paper, then only you start designing the app on the VB2019 IDE. To start designing your VB2019 app, start VS 2019 and launch the VB2019 project. In the VB209 IDE, you should customize your default form first by using the properties windows. Properties that you can set for the default form are its size, background color, foreground color, font size, title and more. After customizing the default form, you can start adding various controls from the toolbox to the default form and then customize their properties. 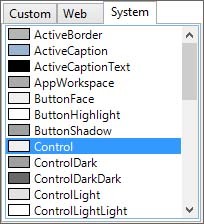 After designing the app UI, you can then write code for all the controls. We will learn more about coding in the coming lessons. 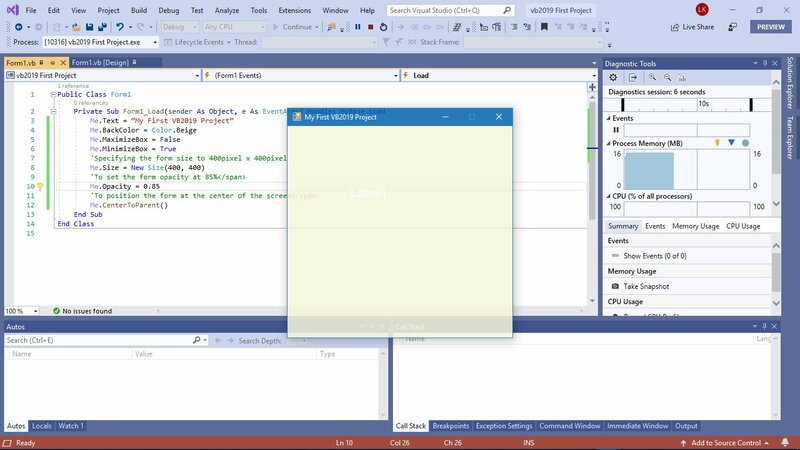 When you start a new Visual Basic 2019 project, the IDE will display the default form along with the Solution Explorer window and the Properties window on the far right, as shown in Figure 2.1. The properties window comprises an object drop-down list, a list of properties and the bottom section that shows a description of the selected property. 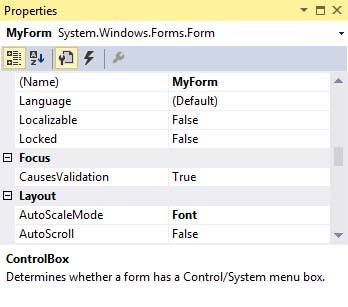 As the only object on the IDE is the default form by the name of Form1, the properties window displays all properties related to Form1 and their corresponding attributes or values, as shown in Figure 2.2. 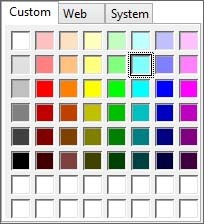 You can change the name of the Form, the title of the Form, the background color, the foreground color, the size and more. Properties can be changed by typing a value or select a value from a drop-down list. 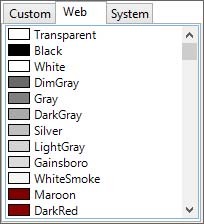 For the color setting, you just need to select a color rectangle or from a color palette. Now let us specify the following properties for Form1. The runtime UI is shown in Figure 2.6. 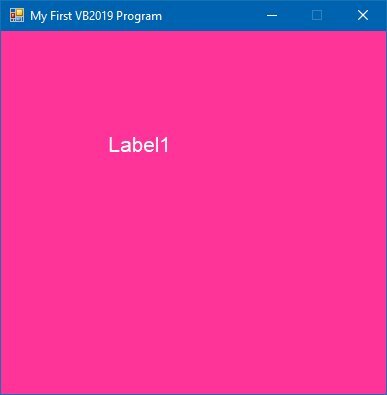 Notice that the title of the form has been changed from Form1 to My First VB2019 Project, the background color is pink, the Label is white and the window cannot be maximized. The Form is positioned to the center of the screen and the faint lines appear behind the Form as its opacity was set to 85%.